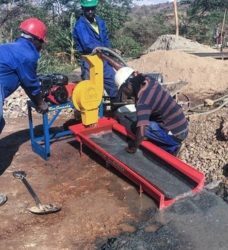 The APT Rocsmasha grinder and Gold Masta sluice in the field. Several of these plants have been installed in various parts of Africa. Next up we have a range of our smaller crushing options. The RD15 is APT's pilot scale impact crusher and has a capacity of up to 1.5tph. The crusher is built based on a robust design that allows for optimum operation, with effortless change out of wearing parts. In addition, the machine is mounted on a skid frame designed to house the GoldKacha, facilitating direct flow from the RD into the concentrator. Below are some images of our manufacture and pre-assembly line. The first is the completed APT 1.5tph hard rock and spirals processing plant, built in a record time of just 6 weeks. Congratulations to the team! Our RD50 Wet Impact Crusher, fully assembled in the warehouse. The RD forms part of our 4-5tph modular crushing plant, and provides remarkable liberation at particle sizes coarser than a ball mill for significantly lower capital and energy requirements. The RD50 Impact Crusher, loaded and en route to site. We hope you enjoyed seeing this weeks equipment focus with these hard rock crushing plants! Let us know if you have any further questions or queries by emailing us on info@aptprocessing.com or finishing this contact form online.